May 8, 2017 – This week, our time machine hoists the Jolly Roger, that notorious black flag with a skull and crossbones that sent shivers down the spine of God-fearing men and woman on the high seas. Shortly after we set sail, we’ll meet Massachusetts fisherman Philip Ashton, whose capture and escape from pirates, earned him status as America’s real-life Robinson Crusoe. We’ll also cross swords with Ashton’s nemesis, the pirate Edward Low. He’s forgotten today, but in the 1720’s, Low surpassed even the infamous Blackbeard, capturing more plunder and killing more people — often after horrifically torturing them first. 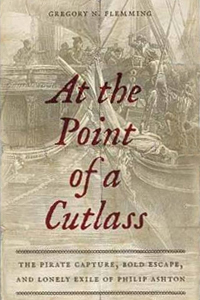 Our captain on these treacherous seas is Greg Flemming, author of Boston Globe bestseller, At the Point of a Cutlass: The Pirate Capture, Bold Escape, and Lonely Exile of Philip Ashton . You can get to know him by paying a visit to GregFlemming.com, @Flemming_Greg, or Facebook.com/Point of the Cutlass.